COTA’s research program works to provide in-depth background information and analysis on various segments of the Canadian organic sector. COTA collects data on organic acreage and on the number of organic producers in the country, while collaborating with industry leaders on an ad hoc basis to assess critical organic issues and respond to the sector’s priorities. For the most up to date publications, please visit our Shopify Store. 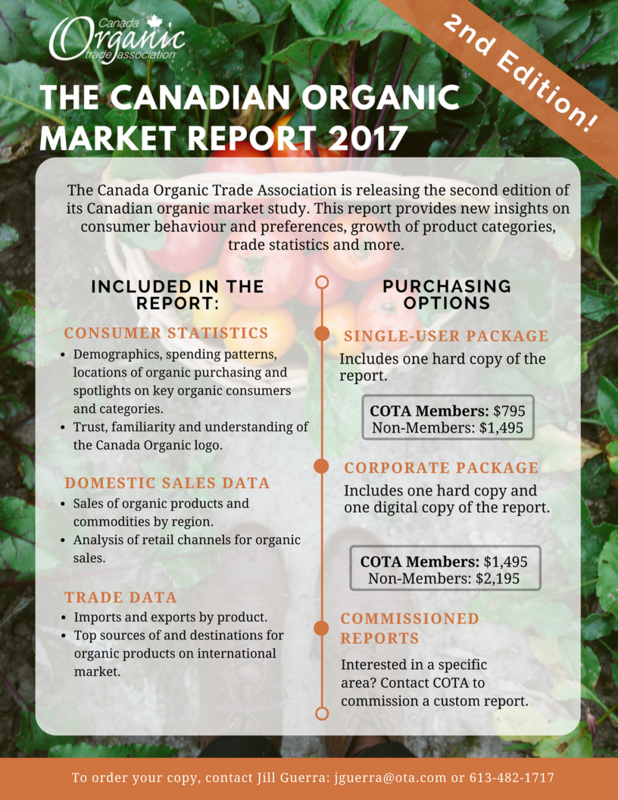 In November 2017, COTA released the second comprehensive Canadian organic market analysis. This in-depth publication provides the most up-to-date overview of the Canadian organic market. It combines consumer research, sales figures and trade data to provide valuable insight into consumer behaviour and preferences, market size and growth trends. See the Press Release and a one-pager of key findings. Click here for an overview of what is included in the report. To purchase your copy, check out our new store or contact Jill Guerra! Currently, the Report is only available in English. If you are interested in obtaining a French copy, please contact us. En novembre 2017, COTA publiera la deuxième analyse complète du marché biologique canadien. Cette publication en profondeur fournit l'aperçu le plus à jour du marché biologique canadien. Il combine la recherche sur les consommateurs, les chiffres des ventes et les données commerciales pour fournir des informations précieuses sur le comportement et les préférences des consommateurs, la taille du marché et les tendances de croissance. En ce moment, le rapport est seulement disponible en anglais. Si vous êtes intéresse à procurer une copie en français, veuillez contacter Jill Guerra. If you are interested in COTA's first market report, "The National Organic Market: Growth, Trends and Opportunities, 2013", please contact us. Detailed reports for the provinces of British Columbia, Alberta, Ontario and Quebec were also released. You can access the Executive Summary and national highlights in English and in French. In 2016 and 2017, COTA has commissioned organic consumer Ipsos polls looking at organic puchasing patterns related to region, age, household type and more. This data has been comprehensively incorporated into the Canadian Organic Market Report. Selections of this data have been released periodically, including a press release on Wednesday September 13, 2017. COTA partners with COG, certifying bodies, and regional groups to compile annual Canadian organic production statistics. COTA's data collection and analysis produce a 'best estimate' of Canadain organic production. The 2015 collection was the first to include data from all Certification Bodies. We commit to improving and streamlineing the data collection process to produce the most robust data possible. In March 2018, COTA released our organic operations and production data for the year 2016. These findings show that there are over 5,400 certified organic operations across Canada, operating on 2.9 million acres of agricultural land. Check out our Organic Agriculture in Canada: By the Numbers fact sheet to see the full analysis of Canada’s domestic organic production. COTA has released the first comprehensive study on the organic and ecological seed market in Canada, conducted in partnership with the Bauta Family Initiative on Canadian Seed Security, a project of USC Canada. 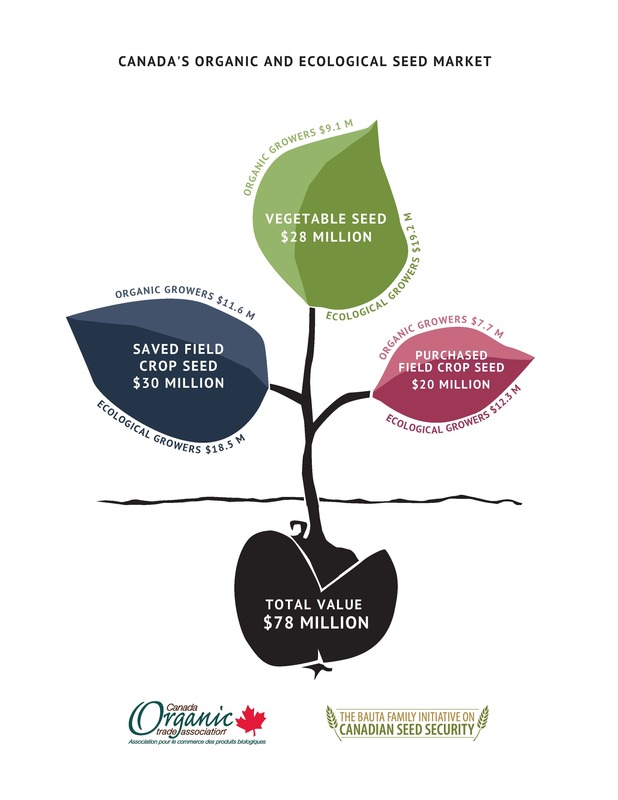 The study shows the current value of organic and ecological seed in Canada at over $78 million per year, including $28 million in vegetable seed and $20 million in purchased field crop seed. The research also reaffirms the value and importance of saved seed for organic farms, at over $30 million per year, and recommends public policy to support the continued growth of the organic sector, including the practice of seed-saving.